Actinomycosis of the parotid masquerading as malignant neoplasm. Primary actinomycosis of the parotid gland is of rare occurrence and can mimic a malignant neoplasm both clinically as well as radiologically. We present here a case of primary actinomycosis of the parotid gland presenting with a parotid mass lesion with erosion of skull bones. Clinical presentation of cervico-facial actinomycosis is characterized by the presence of a suppurative or indurative mass with discharging sinuses. The lesion demonstrates characteristic features on fine needle aspiration cytology and histology, however at times the findings are equivocal. Although cervico-facial actinomycosis is well described, primary actinomycosis of the parotid gland is rare. Actinomycosis was considered to be the commonest of all deep mycotic infections or mycetomas in the past . However now it is well established that it is a granulomatous lesion characterized by chronic suppuration usually caused by Actinomyces israelii which is a gram positive, non-acid fast, anaerobic, commensal bacteria within the oral cavity (tonsillar crypts and tartar of teeth). Unlike most of the mycotic infections, actinomycosis is not an opportunistic infection and the portal of entry is not through inhalation. Actinomycosis usually occurs in healthy individuals when the local condition favours its growth and very often, it is a mixed bacterial growth . It commonly affects the facial soft tissue although it can spread to adjacent, salivary gland, bone, and skin of face and neck. Primary actinomycosis of the parotid gland is very rare and can mimic malignancy . The diagnosis of this rare condition can be reasonably made empirically even when conclusive histological or microbiological evidence is not available. A case of primary actinomycosis of the parotid gland, which was diagnosed by its clinical features, radiological findings and its response to empirical medical management, is presented. A 38-year-old man presented with a 5 × 4 cm rapidly progressive, firm swelling in the left parotid region with discharging sinuses on the overlying skin. The swelling was not painful and its size did not change with meals. There was no history of fever, malaise, cough, breathlessness, haemoptysis, trauma, surgery, recent tooth extraction, or dental infection. There was no history suggestive of Hansen's disease or sexual contact. He was not diabetic or immunocompromised. 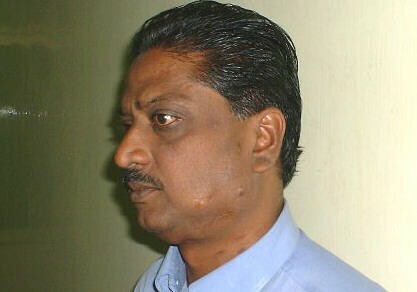 The swelling was confined to the parotid region (Fig 1, 2) rest of the face including submandibular region appeared normal. A 1.5 × 1.5 cm firm jugulodiagastric lymph node was palpable in the neck. Oral cavity, oropharynx, and indirect laryngoscopic examinations were normal. 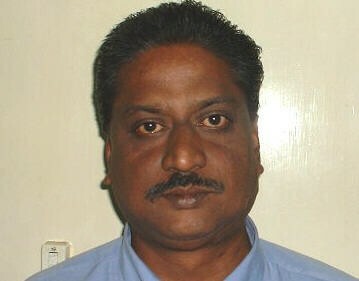 Mouth opening was adequate and there was no facial nerve palsy. Routine investigations including blood counts, erythrocyte sedimentation rate and chest X-ray were normal. ELISA test for HIV antibody was negative. 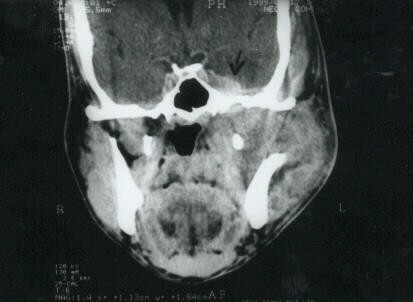 The computerized tomographic (CT) scan showed a large parotid swelling extending to the base of skull with involvement of the skull bone (Figure 3). The mass lesion was seen extending into the parapharangeal space with thinning of the lateral wall of the maxilla on the left side (figure 4). The picture was suggestive of malignant neoplasm of the parotid gland. 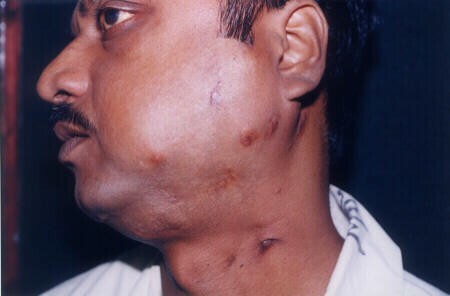 Clinical photograph of the patient at initial presentation showing the parotid swelling. Clinical photograph of the patient (left profile) at presentation showing parotid swelling and the draining sinuses. 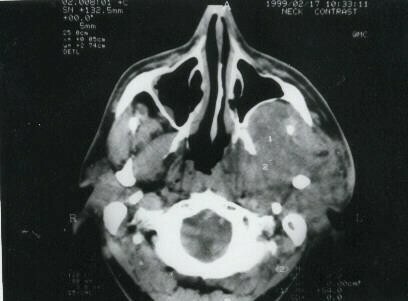 CT scan showing mass in the parotid region with erosion of the base of skull, suggestive of a malignant parotid neoplasm. CT scan showing the mass lesion in the parotid region with extension into left parapharyngeal space and thinning of lateral wall of maxilla. Fine needle aspiration cytology (FNAC) of the parotid swelling and the neck node showed dense collections of neutrophils and macrophages with phagocytic activity, suggesting a chronic inflammatory process. Incision biopsy of the nodule with underlying parotid tissue showed salivary gland tissue with periductal lymphocytic infiltration in some of the ducts and adipose tissue, muscle bundles, sheets of lymphocytes, histiocytes, plasma cells, neutrophils and necrosis, suggestive of chronic sialadenitis. No fungal hyphae or bacteria or spores could be demonstrated in either the FNAC or in biopsy. AFB staining was negative. Based on the clinical, radiological and pathological findings a provisional diagnosis of chronic inflammatory pathology, probably actinomycosis was arrived at and the patient was started empirically on oral penicillin 500 mg 6 hourly for three weeks with complete clinical response (Fig 5, 6). The patient is disease free after and on regular follow-up after 2 1/2 years. 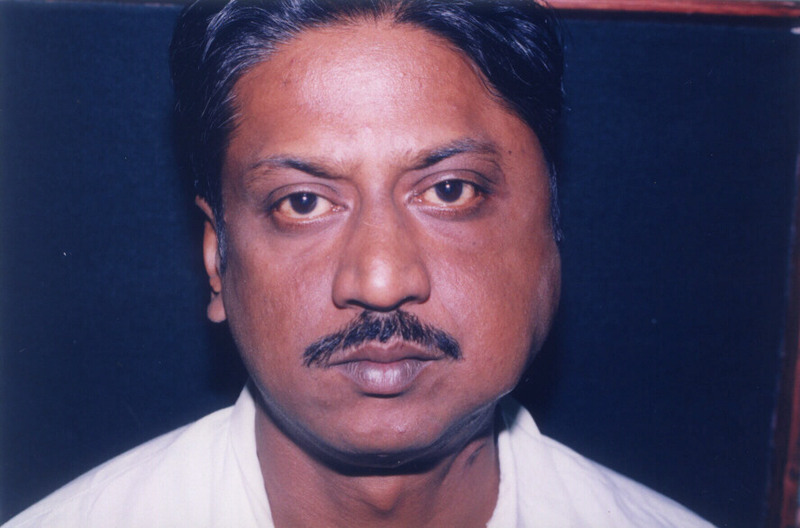 Clinical photograph (left profile) of the patient after completion of the treatment showing the healed sinuses. Recognized routes of entry for cervico-facial actinomycosis include caries tooth, tooth extraction site and tonsils. It can also occur as a complication of trauma to respiratory and digestive tracts including operative procedures. Infection usually starts in the subcutaneous and submucous tissues and spreads by direct continuity [1, 2]. Clinical presentation of cervico-facial actinomycosis is characterized by the presence of a suppurative or indurative mass with discharging sinuses. Pus from the discharging sinuses contains tiny yellow sulphur granules, which are diagnostic . Common initial symptoms of infection including pain, fever, erythema, oedema, and suppuration may be absent . Histopathological feature are similar to that of chronic inflammatory disease. FNAC and exfoliative cytology may demonstrate Curshmann's spirals and actinomycetes filaments in fortuitous cases . Ultrasound and radiological investigations fail to differentiate them from malignancy, although conventional sialography or computerised tomography (CT) with sialography has been suggested to present a consistent pattern in infections . A CT scan finding of soft tissue and bony invasion, simulating malignant neoplasm, helps in distinguishing actinomycosis from other suppurative or granulomatous masses. Drug of choice is penicillin or tetracycline. Anaerobic cultures may be helpful in selecting the appropriate antibiotic in refractory cases. Treatment is essentially medical with adjuvant surgical procedures like incision and drainage, and wound toilet [9–11]. A high index of clinical suspicion and negative tissue diagnosis of malignancy is the key to a presumptive diagnosis of this rare condition.